Talk — there is a lot of it in our modern world. Seven billion people and counting, and most of us talk. So let me add a little more. As a radio host and reporter, I talk for a living. I like to talk about music, Life, art, history, language, our extraordinary Earth, human experience, space exploration, raising chickens, old maps, clean technology, bio-dynamic farming, as well as the culture and wisdom from ancient civilizations that you don’t hear about in school. Despite the fact that I was born in an extremely violent century and humanity’s brutal, destructive, stupid and conformist temperament is being displayed to us on a daily basis — I still have this huge conviction that we can exist differently on this planet. My experience has shown me that every single individual is born with some kind of talent and that a tragic wastefulness is happening all over the world in the field of recognizing and appreciating these talents. As an example, I believe that women and men are completely equal and complementary to each other and that there will be no healthy society anywhere until this balance is restored. I also believe that you, dear Reader, are able to contribute to a balanced society for the future, because it all begins with you appreciating your Self, your Life, your Opportunities, and your wild and wondrous Earth. My Grandmother told me when I was a little girl: We live in our language. I have contemplated and questioned the wisdom in her words ever since. Photography and writing are two wonderful forms of art, because there is a lot of room to experiment and play with Point Of View (POV). In my experience, both art forms are languages in their own right. As an example of POV, I will tell you a story about two photographs I took several years ago, of a flowering desert cactus. Even though the subject matter of the photos is exactly the same, they each express a very different message. In our modern English language, the phrase To Look Down Upon Something or Someone means to have no respect. Physically, we see with the back of our brains, not our eyes. Mentally and emotionally, we see through the filters of words and phrases. The information of language has been stored in our brain since childhood through millions of connections we have learned to make through experience. How does language influence our view of life and the world? Let’s look at the second photo I took of the same desert flowers about 30 seconds later, from a different point of view. The camera settings were the same and no post production software was used to enhance the digital image. The Point Of View is now from the ground up, looking at the flowers as they show their splendor to the Sun and the Sky. In our modern English language, the phrase To Look Up to Someone or Something means to be respectful. When I first started photographing in 1989, I habitually chose my POV without even thinking about it. Consequently my early photographs were quite bland and uninteresting. It took an African painter with a different cultural background than my own to explain, that I was photographing things in a way that people saw them all the time, which made them look ordinary and boring. She told me it is the job of an artist to present the ordinary things of life in an extraordinary way. Through photography, I learn over and over again to seek for different perspectives to meet the same world in a new way. My camera has better eyes than me. I am astonished at how many things my eyes skip, partly because of a belief that I already know what I am looking at. The cactus flowers proved once again that I did not know what I was looking at when I took the first boring picture. 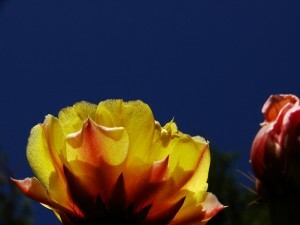 When I saw the second photograph on my computer screen, the flowers’ explosive colors, design and Life Power knocked my preconceptions of what a cactus was into smithereens. I am amazed at how habits of language and thought can narrow the experience of life. 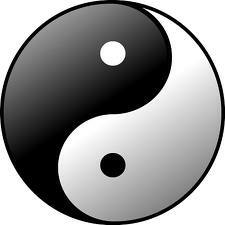 I am also amazed to learn that not any one human has the same Point Of View as another, because no mind is exactly alike. During the past 35 years, since the early 1970s, 25 to 30% of all wildlife has vanished from our planet. If things continue as they are, half of all the animals that were alive when I was born will be gone by the time I am a grandmother. I think the moment to reconsider our perspective on our relationship with the natural world is past due. There is the physical reality, such as recycling, renewable energy, responsible farming and reforestation, which are all of vital importance to a healthy future. However, there is also the mental, emotional and spiritual question of the physical changes that need to be made. How do we relate in a more intimate, fulfilling way to this wondrous planet of stones, volcanoes, rivers, plants, forests, animals, flowers, rain, wind, seas and snow? Why are we here? Why is Life precious? Who are we? Why does it matter to protect the everyday miracles? What for? And what will we do with the world once we have saved it? I am a nomad, just like hundreds of thousands of other humans on this planet. 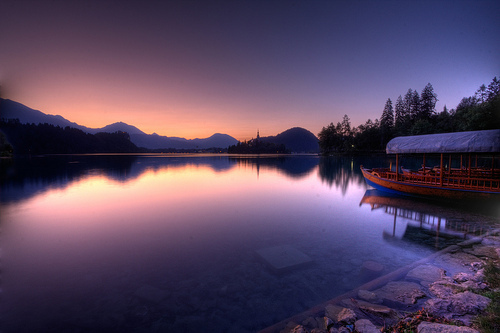 I do not have a permanent home, and I do not take vacations. I work as a creative artist — writing, filming, painting, running an independent music label and occasionally hosting an rtv show or business event. Yes, of course there is worry. About money. About the next place to stay. However, worry existed when I had a “steady job” too. For a long time, people like me were called “hippies” or “vagabonds”, insinuating that a nomadic lifestyle somehow equals being irresponsible or undisciplined. On the contrary: in my experience, you have to be incredibly well organized to lead a professional life on the road. Sociologists invented the term “New Nomads” for spoiled brats like me, whose professional lives depend on digital communication systems while exploring the world. Finally — I belong!! One thing is for sure: Nomadism keeps you on your toes. You have to continuously open your mind to new perspectives. You can’t get stuck in your ways. You have to abandon certain ideas of comfort. All of this helps to keep you growing, one day at a time. Recently I visited an old, rustic fishing village in North America. The tiny town sits on the 45th parallel, which marks the exact halfway point between the Equator and the North Pole. The scent of freshly smoked fish delighted my spirit and transported me to bygone times. 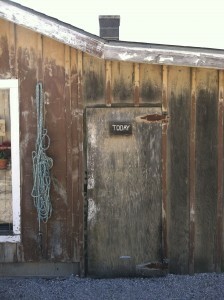 Suddenly a tiny sign on the door of a weathered, wooden shack caught my eye. When you think about it, everyone is a nomad — even those who live in one place their life long. Life is short and we are in transit around our local star, the Sun, all the time. So let’s make the most of Today and give some Love. Oops — maybe a hippie after all? P.S. For more information about the lifeways of New Nomads, visit www.nunomad.com. I walked into a store in Miami the other day, together with a friend. As soon as we were inside, the fire alarm went off, so we hurried out again. We decided to go have a bite to eat first and then return to the store afterwards. Everybody in the store cracked up laughing. Whoever you are, you made my day. (The guy â€“ that is). For the last four years, I have tended a nomadic musical garden on KX Radio, creating a non-format called ConneKXions. During my travels, the Bluebird Studio has lit up its tiny red and yellow lights in all kinds of places. Some shows were recorded with the microwave in a friendâ€™s kitchen as the studio surface. Others found their birth on a sturdy oaken desk on the 26th floor of a hotel room in former East Berlin. Others were created on a wobbly, plastic lace-covered folding table in the front yard of an English cottage. Sometimes circumstances only allowed for the back of a pick up truck. My views from these varied locations ranged from harsh, concrete parking lots to vast, starlit deserts, from cute Dutch canals to sheep-filled meadows and Bladerunner-esque skyscrapers bordering a ghetto. â€¨As long as there was an Internet connection available, the show rolled on, celebrating music from as far back as 100 years, when public radio was only a dream. â€œHow do you know which songs to play?â€ people often ask me. â€œHow can you explain falling in love?â€ I ask in return. 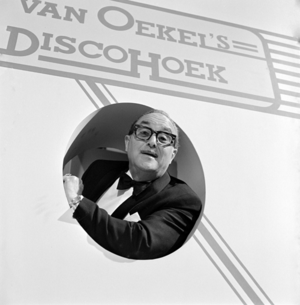 **Sjef van Oekel was a well-known Dutch comedian, the song’s title translates as â€œSauerkraut With Greasy Gravyâ€ and is an ode to food. The scent of a flower, the look in the eyes of a songbird, the taste of a cookie, the memory of a loved oneâ€¦.all of these amazing experiences connect us to the great mystery, called Life. And yes, of course — with some songs it can be a particular chord change, a lyrical phrase, a photograph or the life story of an artist that inspires and guides the random music choices, which characterize ConneKXions. However, most often it is just a change in the direction of the wind. An articleÂ publishedÂ in a National Geographic issue a couple of years ago illuminatesÂ toÂ the reader that our oceans are dying. The reason given isÂ acidification.Â Too much CO2 by itself is apparently not the only thing that causes the problem.Â It is the mixing of chemicalsÂ withÂ the high levels of CO2,Â whichÂ creates a toxic cocktail for millions of creatures — from the tiniest bacteria to coral reefs and the fish that feed us. Why do we keep pouring sewage and industrial waste into the places that literally give us Life?Â Next time I wash my hands with anti-bacterial soap, I will remind myself that eventually, those bacteria killers will also destroy essential bacteria that live in the rivers and seas, because, ultimately,Â that is where the water in my sink flows to. 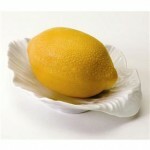 Â I think I will switch to the good old lemon soap that my Grandma used. An example came to my attention recently, of a group of people who live in a wealthy area of a German town,Â whichÂ sits on the shores of a beautiful lake.Â The lake had literally died, after putting up with decades of sewage and chemical disposal.Â Nothing was left alive. The concerned people came together with money, which fortunately they had plenty of, and a willingness to change something to bring the lake back to life.Â They worked with their town council to move the sewage system away from the lake shore, and instead build a different kind of sewage plant outside of town, where there was plenty of room for leech fields.Â In this way, they put their sh*tÂ on the land, where it could feed the ground and make plants and trees grow, instead of pouring it into the lake, where it killed everything. The prediction was that it would take ten years for the lake to revive.Â However, from the moment the changes took effect, it only took five years before fish started spawning again.Â After two more years, thereÂ wereÂ enough fish in the lake for people to start fishing. In other words: when given the chance, the power of renewal in Nature is astounding! The technologies are already there.Â The savvy, brilliant geniuses are already there.Â The infrastructure is already there.Â The ONLY thing missingÂ is money.Â Leadership will follow when there is money on the table. When Franklin Delano Roosevelt became President of the United States during the Great Depression, he initiated enormous growth in the job market by starting government-run programs that improved American cities with parks, brought electricity to rural places and upgraded the country’s infrastructure.Â Hundreds of thousands of people could eat and care for their families because of these programs, while at the same time, their country was improved. P.S. Don’t know where to start? Check out these Earthloving Links. Many sounds travel on the wind. The bells and whistles of The Great Iron Horse make me wander in my mind to faraway places. The Earth has become smaller since the advent of planes; however — nothing can substitute for the adventure of trains. For many decades, millions of people have had their socks knocked off by the sound of a hard-driving five string banjo. 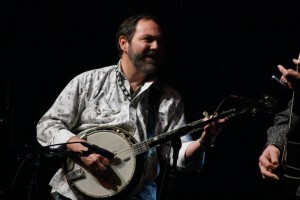 Reason enough to meet with Richard Bailey: Grammy-nominated, longtime original-banjo-practitioner, currently with The Steeldrivers in Nashville. For many hundreds of years, human beings of the English speaking variety have talked about a very special, Magical Item — a Thing of unknown shape, proportion, color or substance, that — according to lore and legend, provides The One-And-Only Key To Getting Things Done. 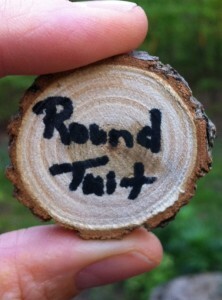 The saying goes, that you MUST get a Round Tuit (pronounced: “round-to-it”), before you can do something. â€¨Evidently, or so it is believed, humanity is powerless without a Round Tuit, and yet no President ever speaks about it. After 45 years of searching, I finally found my Round Tuit at a gas station in Tennessee. It was laying on a shelf between some brightly colored Easter baskets and a few dusty, ceramic mugs with prints of cowboys, lariats, horses and cows on them. 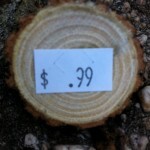 My lovely, little Round Tuit is the size of an ancient Dutch coin called a “Rijksdaalder”, and it consists solely of a thin slice of tree branch. It became mine for only 99 cents. Now, there are no more excuses! WHAT?! Are you telling me that The Holy Grail of Human Decision and Action is made from a Tree and not from shiny gold? Come to think of it, that actually does make sense. Without Trees, we don’t get anything done. Each home and every era has a sound of its own. Sometimes this is a guitar, a harp or a piano; these melodies and rhythms say much! The banjo rings and sings a tune that is now recognized worldwide. Finally, we can all become part humbug, honey bread, a smiling moonlit night and a kiss.